Ousted Egyptian Leader Mubarak Sentenced To Life In Prison : The Two-Way Former President Hosni Mubarak was convicted on Saturday in connection with the killing of protesters during last year's uprising. The protests pushed Mubarak to resign after nearly 30 years in power. 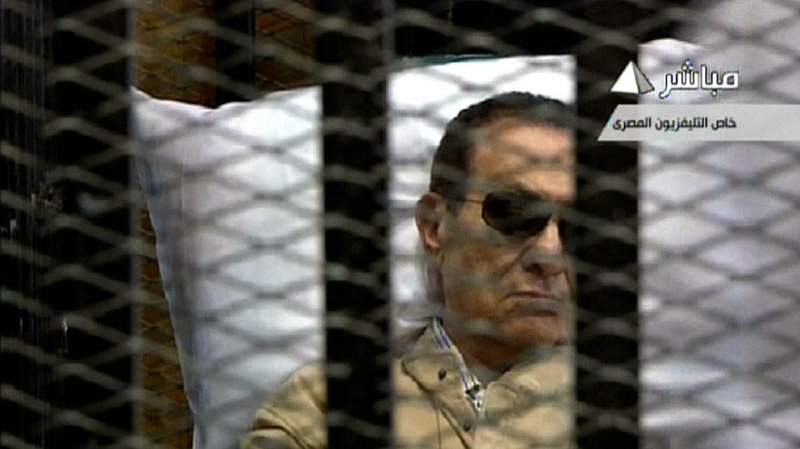 An image grab taken from Egyptian state TV shows ousted Egyptian president Hosni Mubarak sitting inside a cage in a courtroom during his verdict hearing in Cairo Saturday. Hosni Mubarak received a life sentence from a court in Cairo today after being charged in connection with the killing of protesters during last year's uprising. The uprising pushed Mubarak to resign last year after nearly 30 years in power. NPR's Soraya Sarhaddi Nelson reports Mubarak's sons, Gamal and Alaa, were acquitted of corruption charges because the time limit had expired. Former interior minister Habib el-Adly received the same sentence as Mubarak. The Associated Press has a breakdown of all the charges and verdicts in the case. "Mubarak looked emotionless, wearing a beige windbreaker sunglasses on his hospital gurney, his sons ... in prison whites, stood in front of him to protect him from the cameras." She confirms that the former leader has already been transferred to the Tora Prison in Cairo. "Scuffles between Mubarak supporters and opponents broke out inside and outside the courtroom after the verdict was read, reflecting the deep polarization of the country since Mubarak was overthrown on Feb. 11, 2011." "Lawyers involved have said that many questionable procedural decisions during the yearlong trial had left ample grounds to continue the legal fight. Convicting Mr. Mubarak and Mr. Adly on the basis that they failed to stop police from killing protesters would not normally meet the standards of international or Egyptian law for a murder conviction." "As the verdict was read, people set off fireworks, started dancing, started screaming, started crying. [They were] leaping for joy that Mubarak had received some type of conviction, even if it wasn't the death penalty, which a lot of people wanted. They were very happy that, as they say, some kind of justice was done." As the BBC reports, however, "joy soon turned into angry shouts" outside the building when the crowd heard six aides to the former interior minister were acquitted. There were also clashes with riot police and demonstrations in Suez, the BBC says. Update at 3:39 p.m. ET. Will Egyptians Accept The Verdict? Thousands of demonstrators have flowed back into the Cairo square that gave birth to Egypt's Arab Spring last year. Thousands of riot police are also busy on the streets outside the courtroom, the AP reports, where the jubilant atmosphere following the verdict "descended into tensions and scuffles." Many Egyptians had expected Mubarak to receive a death sentence, as Al Jazeera says, and the acquittal of his aides further inflamed tensions. After the verdict, several groups, including the Muslim Brotherhood, rallied people to protest across the country. "Many of Egypt's revolutionaries are bitterly disappointed by the choice they now face — between a Muslim Brotherhood candidate, Mohammed Mursi, and Mubarak's last prime minister, Ahmed Shafiq." Shafiq, Knell reports, "has responded to the outcome of the trial saying that all verdicts 'must be accepted' and that the rulings will serve as a 'historic lesson' for all future presidents." That may not quell rising fears that today's sentences may be overturned on appeal — particularly after the new president takes office.